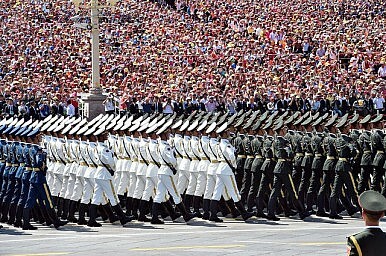 Many scholars have offered analysis of the Chinese military parade, held early this month to commemorate the 70 anniversary of the end of World War Two. Much of it has studied the capability of the equipment or deciphered the political and military messages. According to the Chinese official media, however, one of the “bright spots” of the parade was the inclusion of generals in the formations, a first. Why such an unprecedented arrangement? Its significance is just as great as the display of advanced weaponry. To look for answers, we have to study the ongoing politics of anti-corruption and changing civil-military relations, as well as the internal problems facing the Chinese People’s Liberation Army (PLA). Since the Chinese government released its first list of generals under investigation for graft and corruption in January this year, more and more leaders above the group army level have been implicated. This reporting is consistent with Xi Jinping’s policy of combating corruption in order to rectify the Communist Party’s alienation from the people and reinvigorate its ruling capacity. While the prosecution of high-profile personalities who are collectively nicknamed “tigers” serves to show Xi’s determination to put words into deeds, the expanding list simply testifies to the poor quality and integrity of those in power. For the PLA, the consequences have been disastrous. The military is seen by common Chinese people as a hotbed of all kinds of corruption and poor discipline. Although the army was divested of all businesses in the 1990s, economic crimes and disciplinary problems have not gone away. Both the two vice-chairmen of the Central Military Commission, Guo Boxiong and Xu Caihou, were prosecuted. Both had been appointed by Xi’s predecessors. The hunting down of these “tigers” and other generals has been a blow to the reputation of the PLA, which has in recent years tried hard to build an image as a professional custodian of national interests. Perhaps the parade could begin to repair the damage. Inside the army, the rank and file have more reason to question the competence and impartiality of their superiors and leaders. Given its origin as a mass army, the PLA has paid special attention to officer-solider relations and to the so-called grassroots level. The Maoist era emphasis on egalitarianism and comradeship gave way to a focus on a hierarchic organization and formal chain of command when Deng Xiaoping led China into a period of modernization. This has cost the army the internal bonding it once enjoyed. No wonder Xi Jinping revived the practice of sending generals and senior officers to the grassroots level for short-term job exchanges. Again, this is consistent with China’s general political directions under Xi Jinping, especially his mass line policy. As tensions rise, the PLA feels an urgency to call for greater organizational unity and coherence which, it believes, produces combat proficiency. The high command thus wants to dispel the image that senior leaders enjoy privileges and are out of touch with the lower echelons. Therefore, the generals participating in the parade were subject to the same stringent drills and living conditions as the soldiers. An anecdote had it that a 56-year old major-general was among the soldiers ordered by a staff sergeant to tie sandbags to their arms to practice proper salute manner. Each day, they had to practice saluting more than 400 times. The message of these media reports is clear. The generals are not above their soldiers. It could be said that a crisis of faith has emerged in the Chinese military. Soldiers are increasingly skeptical of the military competence of their leaders, who, in their eyes, only give orders and design training programs from air-conditioned offices, while shouting empty slogans. In an attempt to close the schism and to earn the trust of the rank and file, the PLA is placing greater emphasis on leadership. It has adopted a two-pronged policy, demanding that all commanders update their military skills and keep in shape. More and more drills and evaluation exercises have been organized specifically for so-called leading organs, regardless of their rank. The army mouthpiece, Liberation Army Daily, also carries reports that senior officers are examined by their grassroots level counterparts. All of this is aimed to show the soldiers that those who lead them are capable and qualified. Of course, physical appearance is often the first attribute to be noticed. To eliminate the image of big-bellied leaders, the PLA’s four general departments jointly announced earlier this year a document on military physical training reform for 2015-2020. Officers slated for promotion must meet certain physical fitness criteria. In fact, the PLA has already set up a physical training base, laid down physical fitness standards, and organized physical fitness training programs. In the parade, for example, the J-10 and inflight refueling echelons were led by two major-generals, to show that even generals could fly and were capable of meeting the stringent formation requirements. Those on the ground were ready to march together with their soldiers, facing the same hardships. In short, the appearance of the generals from all arms and services in the parade was not a simple act of honoring individuals. It had a political message no less important than the parade itself. The repairing of reputational damage, the showcasing of organizational unity, and the demonstration of military and physical fitness of senior leaders obviously targeted the public and, more importantly, the soldiers and junior officers at the grassroots level. The PLA understands that winning wars requires more than advanced equipment and smart strategies – a capable, reliable, and effective leadership is also needed. Ka Po Ng is a professor at the University of Niigata Prefecture, Japan, teaching security studies and Chinese politics. He is the author of Interpreting China’s Military Power: Doctrine Makes Readiness as well as articles on China’s defense policy and Asia-Pacific regional security.